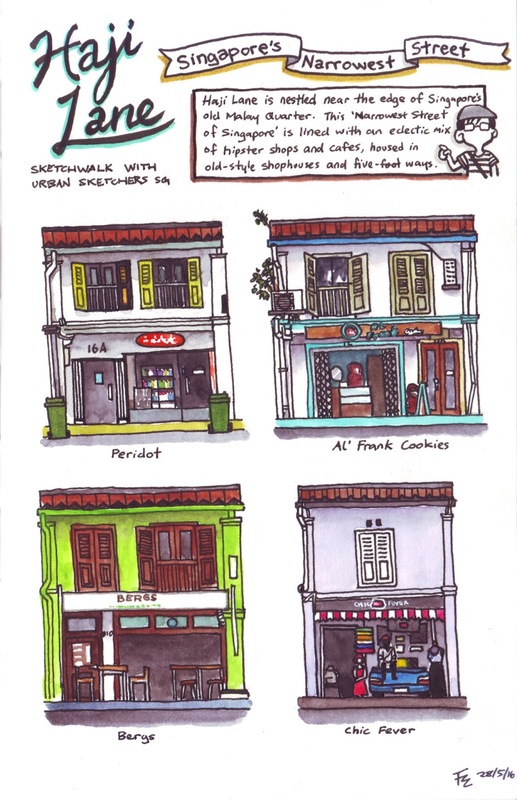 Haji Lane sits at the edge of Singapore's old Malay quarter of Kampong Glam (as in "gelam tree", not "glamorous"). It is reputedly Singapore's narrowest street, lined with old-style shophouses and five-foot ways. Today it is home to rows of funky, trendy, hipster shops and cafes in an area that is full of Malay/Arab/Musilm shops that sell anything from fabrics to alcohol-less perfumes and delicious Muslim food like biryani, prata, murtabak, and nasi goreng. 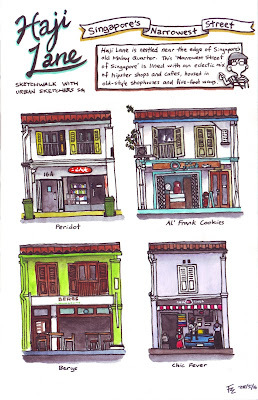 The Urban Sketchers paid Haji Lane a visit today for our monthly sketchwalk, and we had a great time sketching. I had to assist with leading the group, and I decided to approach today's session by drawing several shopfronts! this odd-looking tiny skinny dog! It looked like an alien! That's really pretty designs. If anyone from you interested in buying the shop fronts London then you can easily contact to our company. We offer you low cost service within the time period. Anyone from you interested in buying shopfronts in London then you need to contact the United Shopfronts Ltd. We are the leading manufacturer in London offers the best and high-quality material made products at really cheap cost. If you want a Best Quality shopfronts in london then you can visit our store or website.we are dealing in manufacturing, repairing etc. If you are searching for Shop Fronts in London then just visit Excellency Shopfitters LTD. Our perfect team of engineers can give reliable services at a very reasonable cost. For more details, visit the link.